When the media calls you “The Next PayPal,” you can bet the real PayPal will come a’knocking. Or throw fistfuls of cash in your direction. According to a reliable source with knowledge of the transaction, e-invoicing company, TradeShift has just secured between €12 to €15 million euros from PayPal ($16 to $21 million dollars). The deal, the source says, was done quietly, with PayPal doling out the euros in the form of a loan for TradeShift. When asked to comment, the Denmark startup’s CEO and co-founder Christian Lanng said he could not discuss the speculation at this time but implied that fundraising efforts have been robust this year. A PayPal spokesperson said the company does not comment on rumors or speculation. 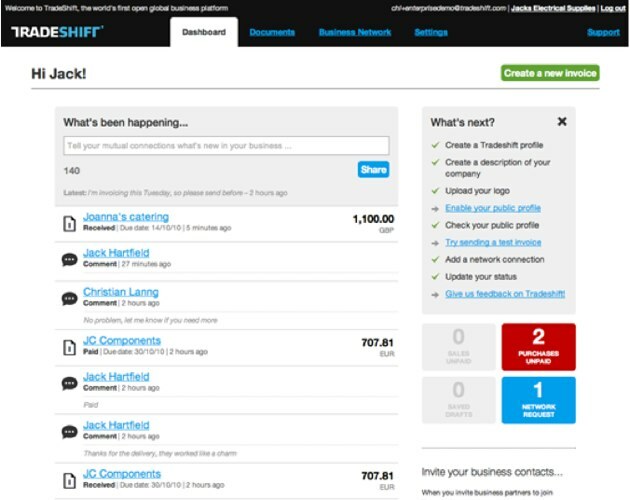 TradeShift, which has been referred to as “Skype for invoicing” (and as noted earlier, “the Next PayPal”) is an e-invoicing company that is trying to change the way businesses manage their online transactions. The startup currently offers a free platform that allows clients to take advantage of dynamic invoicing—a system whereby Tradeshift tracks exchange rates, and when the rates are most advantageous, takes funds and makes purchases. TradeShift also offers tracking tools and a permanent repository to store all current and past invoices, allowing you to pull up any previous invoice within 5 seconds. As Butcher pointed out in his February post, these transactions are free but they are legally binding. Founded by Christian Lanng (formerly worked on IT for the Danish government), Gert Sylvest and Mikkel Hippe Brun, the team has attracted major clients, like TDC a major European telecom company, and notable seed investors. Earlier this year they wooed two high profile investors:Mårten Mickos, the former CEO of MySQL, and Stefan Glaenzer, initial investor in LastFM. According to reports this summer, VCs were trying to get in at an $80 million to $100 million valuation. At the time of this report, Lanng said he could not disclose the size of the recent seed round, but said the company has been very successful in raising capital this year.